Liberty Boats was founded in 2007. We are a manufacturer of inflatable boats and our goal is to supply premium quality inflatable boats at very competitive prices. Our handcrafted inflatables, with quadruple seam construction, insure quality and dependability in every boat produced. We are pleased to offer our customers a quality product which is reliable, fun to use and affordable. While our products are offered online on the web, they can also be viewed & purchased from us or from your local dealer. All our boats conform to Canadian government regulations and carry the required Transport Canada conformity and/or capacity sticker on the transom as required by law. 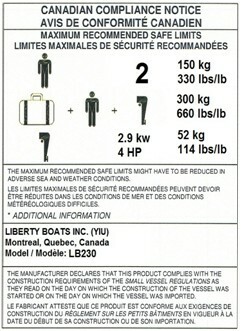 Liberty Boats is assigned the “YIU” ISO manufacturer indentification code by Transport Canada. The code and Sticker are valid both in Canada & the USA. Our boats also have CE certification for Europe. Our PVC inflatable boats are manufactured with high quality 1.2 mm thick 1200 Decitex high tensile low stretch polyester fabric covered with specially treated PVC on both sides. It is resistant to abrasion, harsh chemicals, extreme conditions and gives our boats excellent dimensional stability. Our boats are hand made using polyurethane adhesive, featuring quadruple seams construction and are available in a variety of colors. Similarly, we manufacture our Hypalon boats with top quality ORCA820 fabric. One area frequently overlooked by first-time inflatable boat buyers is the quality of fittings and accessories. Usually the difference is obvious on bargain boats, but inexperienced buyers don’t realize how big an impact inferior fittings have until they actually use the boat. We fit excellent accessories like stainless towing eyes, strong aluminum oars, reliable inflation valves and heavy-duty pumps to help you inflate your boat quickly with minimal effort. LIBERTY BOATS carry a five-year fabric warranty and three year air-holding warranty on hull construction as well as a one-year warranty on parts and accessories. Our premium models offer a 6 year warranty. We love inflatable boats, and LIBERTY BOATS has offered a variety of inflatable boats over the years. Our lineup features an assortment of both small and larger boats, with high-buoyancy tubes (so they can handle the extra weight of modern 4-stroke outboards), and enhanced cargo-carrying capacity. An inflatable’s floor construction is the key to the trade-off between portability, ease of assembly and compact storage, and the rigidity needed for best performance. A rigid deep-V hull made from composite plastic, fiberglass or aluminum — a Rigid Inflatable Boat — is an efficient high-performance planing hull, but RIBs often must be stored on a trailer or set of hanging davits. Boats with more flexible fabric floors fold to a light, compact shape, but their flexibility extracts a performance penalty. If you want your boat to plane, allowing you to exceed 5 mph, a semi-rigid floor is required. How do you select the boat that best meets your requirements with so many available choices? Buy the biggest boat that fits within your budget and space requirements. Now buy a reasonably sized boat! There is a good reason we make this recommendation, which may seem self-serving. Bigger inflatables handle dramatically better than smaller ones. The differences between an 8’6″ sportboat and a 10′ sportboat in handling, carrying capacity and ride, due to the small surface area of the small boat hulls, are greater than you can imagine until you actually try them side-by-side. A sportboat less than 9′ long is capable of planing, but tends to be squirrely on the water, and will fall off a plane easily. 10′ boats (and especially 11′ boats) have less bow rise when they accelerate and will stay on plane at lower speeds. They are less sensitive to steering inputs so you can relax more while driving them and their larger tubes with slightly greater freeboard will give you a drier ride. Longer boats also have more usable interior volume. Inflatables have pretty dinky interior spaces due to their chunky tubes and forward-mounted transoms. A 9’3″ boat may only have 7 feet of interior length, and some of that is in the V-section of the bow. By adding a foot to the length, you gain the same amount in the interior, for a 14% increase in floor space. We believe customers buy smaller boats so they can leave them inflated and stored on deck or a swim step, or for ease of carrying to a car or cabin. And we understand that many of our customers have smaller boats and generally have only two people to transport in their dinghy. If you are short of storage space or transport just you and your spouse, then an 8′ boat may be just the ticket. But in our experience customers rarely come back wishing they’d bought a smaller boat, while the reverse is all too frequent. If weight is a prime consideration, we suggest you consider a High Pressure (HP) boat. These are marvelous because they are lightweight and plane easily with engines from 4hp to 15hp. Their extended range at higher speeds, excellent handling and compact stowed dimensions make them an absolute pleasure to own and operate. OK, this is obvious, but put your boat away when it’s not in use. We see dozens of inflatables rotting in the sun in our local harbor, and it isn’t because they’re being used every day. Deflate the boat, clean it and store it. When inflated, the best protection against damaging exposure is a quality fitted cover. In addition to blocking UV radiation, covers also protect your boat from accumulated dirt, bird droppings and standing water. Their modest cost is rapidly repaid by extending the life and the increased resale value of your boat. Oars or paddles, engine spares including spark plugs and a spark plug wrench, basic tools, a small anchor and 200′ of small line, and of course PFDs. Finding the perfect inflatable isn’t that tough. Simply pick the combination of portability and performance that your boating style requires and choose the fabric best suited to your boating environment. A well-built inflatable will often last a decade or more. When all is said and done, it may be the boat you remember most fondly for its amazing versatility.